For many, understanding every aspect of personal finance can be daunting. From investments to retirement to insurance, the decisions can be overwhelming. 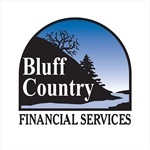 That’s where Bluff Country Financial Services comes in. Our goal is to provide you with guidance that can help you understand and better define your financial goals. We work to create a mutually beneficial and respected long-term relationship with clients and their families.